A burglar who struck and killed a former Navy officer while trying to steal his sports car has failed in an appeal against his murder conviction. Ryan Gibbons was jailed for at least 27 years last November after crushing Mike Samwell under the wheels of his Audi. 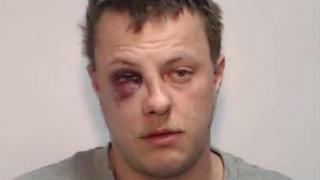 Mr Samwell had been trying to stop Gibbons driving off from his home in Chorlton, Manchester, in April 2017. At London's Court of Appeal, Lord Justice Simon rejected claims that the jury had been misdirected at the trial. Manchester Crown Court previously heard nuclear engineer Mr Samwell, 35, and his wife woke to the sound of burglars breaking into their home and taking the keys to the car from the kitchen table. Mr Samwell ran downstairs in his boxer shorts to confront Gibbons as he was driving off, shouting "get out of the car" but was run over. Jessica Samwell told the court she had held her husband's hand and told him she loved him as he lay dying from chest and heart injuries. Gibbons, 30 of Arrowfield Road, Chorlton, admitted burglary and aggravated vehicle taking, but denied murder, insisting he had not seen Mr Samwell and did not know he was close to the car. A jury took four hours to convict Gibbons of murder and Mr Justice William Davis told him: "You knew you were running over Mr Samwell, you did it deliberately." Challenging the verdict at London's Appeal Court, Gibbons's barrister, Simon Csoka QC, said the cards were "stacked against" his client during his trial. He claimed the trial was unfair because the trial judge had misdirected the jury in relation to the defence case. But Lord Justice Simon said the argument did "not give rise to arguable grounds of appeal or put in issue the safety of the conviction" and refused leave for an appeal.